Features 500 Fashion Contacts At Your Fingertips From Over 30 Countries! Note: This item is to be downloaded immediately after purchase. 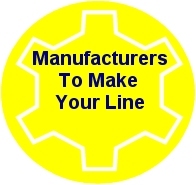 You need a manufacturer to make your line? Maybe make your samples? Look no further. We make finding a factory to make your line super easy with our Ultimate Fashion Contact List! We put 500 fashion contacts at your fingertips and many of their websites are only a click away! On Sale Today for $95. Regular Price $150. Highlights: Get this fabulous eBook Contact List with 500 red hot fashion industry contacts featuring clothing manufacturers from all over the world that manufacture denim, jeans, dresses, t-shirts, skirts, sweaters, hats, buttons, shoes, designer glasses, handbags and more, plus screen printers, embroidery services, blank T-shirt sellers, blank hat sellers, graders, and more! Some of these manufacturers have worked with famous brand names that you have definitely heard of like Akademiks, XOXO, Pepe, JC Penny, Walmart, Tommy Hilfiger and Dickies. Also get: Denim Wash Houses, PR and Marketing Companies, Tradeshows, Fabric Suppliers and more. Plus: Most listing contains vital descriptions of what each contact's specialty is. This truly is the ULTIMATE FASHION LIST! Never has finding the right manufacturer or contacts been easier! Some of the manufacturers listed even produce small quantities without the huge minimums. About this List and Your Choice of Choosing Domestic or International Manufacturing Options - It is now easier than ever to get your clothing made! With the 2016 Edition of our Ultimate Fashion Contact List eBook - a greater emphasis was placed on providing Domestic Manufacturing Contacts for many of our Clients. Being able to find and work with a manufacturer in your own country can prove beneficial on many levels. You can get on a plane, ride in a car etc. to meet with them. You can get your clothing made without the hassle of dealing with importing etc. Sometimes it may just make logistical sense to work with someone close to home. Visiting the factory that is making your line becomes much easier. You will be in excellent striking distance to achieving your dream of having your own clothing line. Many of these manufacturers on our list, particularly in the USA, UK, Canada and Australia even offer small minimums which definitely help out clothing lines just starting out. With this list and the help of our optional products - Digital Fashion Pro to design your clothing, Official Step By Step Guide to Starting a Clothing Line - can have you well versed on getting your clothing made so that you don't make mistakes. There are manufacturers on our list who are looking forward to working with new American clothing lines. There are some that can even help you create a better presentation for your blank t-shirts because you can first engage with a relabeling company to take the tags out of the shirts, i.e. Fruit Of The Loom, Gildan, etc., and place in your own original tags, again that is to give the T-shirt a better or authentic presentation of the brand. The new list can provide you with companies that can do that as well. Never have you been closer to seeing your dreams come to reality then right now! You can Also Get this List Free With the Fashion Mogul Package. Note: We do not endorse or guarantee any manufacturer or company on the Ultimate List. Use the list at your discretion.